A popular Moroccan green-hued sauce used in fish stews, or tagines, is called charmoula. It's a balanced combination of quantities of flat-leaf parsley and fresh coriander, oil, cumin, paprika, and hot pepper. I love it for its powerful taste and the way it permeates the delicate flavor of fish, and in this dish especially it makes marvelous eating. You can make it ahead of time and keep it refrigerated for 1 or 2 days. In Morocco, fish stews are always cooked in earthenware, which is especially helpful when the stew contains tomatoes. (Tin-lined copperware and aluminum definitely alter the flavor.) 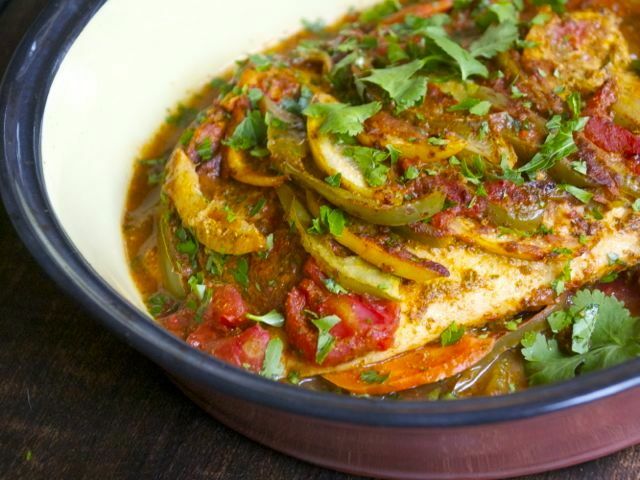 In this Moroccan fish tagine, the rich tastes of tomatoes, green peppers, and hot peppers are offset by the tart, briny flavor of preserved lemons. Traditionally, this tagine would contain an entire fish with the head intact, but I have found it easier to make with thick fillets. Serve the fish directly from the baking dish. Pass slices of anise-flavored Moroccan bread, and accompany with a light, dry red or white wine. Early in the day, or the day before, make the charmoula: In a blender, combine the garlic, spices, herbs, and pepper flakes. Add the lemon juice and olive oil, and blend until smooth. Scrape the mixture into a small saucepan and heat it slowly, stirring, until hot and aromatic, about 30 seconds; do not boil. Let it cool, then divide the spice mixture in half. About 1½ hours before serving, preheat the oven to 300 degrees. Spread 2 tablespoons of reserved charmoula over the bottom of a shallow 2½-quart baking-serving dish (about 10 inches in diameter). Scatter the carrots on the bottom of the dish. Sprinkle with a little charmoula. Add half the tomatoes, bell peppers, and chile pepper; sprinkle with a little charmoula. Lay the fish over the vegetables and cover with the preserved lemon peel and the remaining tomatoes and peppers in a decorative pattern. Spread the remaining charmoula over all. Cover the dish tightly with foil and bake for 45 minutes. Raise the oven temperature to 500 degrees. Uncover the baking dish, baste with the pan juices, and bake in the top third of the oven for 10 minutes, or until a nice crust has formed over the vegetables. Sprinkle with parsley and garnish with sprigs of coriander. Serve warm.